Theresa's Haunted History of the Tri-State: Meteor or Bad Omen Over Huntington? I spend a lot of time at the Cabell County library going through old newspapers. Sometimes I'm looking for information on cases we're working on and sometimes I'm looking for information for my blog. Sometimes, I just stumble upon some really weird and awesome things! That's what happened to me last week, when I was doing some personal research on a family member who was involved in a murder. The following article has been transcribed exactly how it appeared (weird spelling, grammar and all) in the January 13, 1914 edition of the Huntington Herald Dispatch. According to other articles from around the same time period, near this date a meteor was spotted by many over this area of the country. However, this was the only odd tale apparently associated with an otherwise normal event. Several boys who witnessed the meteor near the old C&O Hospital on Huntington's 6th avenue reported it did some pretty strange things! As an added bonus, this article goes on to discuss a haunted house that was located on 20th Street at the time! Note: If you enjoy this story, please check out The East End Pillow Miracle, another newspaper article I found about a bad omen discussed in a local Huntington newspaper. Strange Story of Youngsters Living Near Chesapeake & Ohio Hospital Startles Their Parents---'Twas But Ordinary Shooting Star, Many Declare---Dark Tale of Haunted House in Same Vicinity Heard. 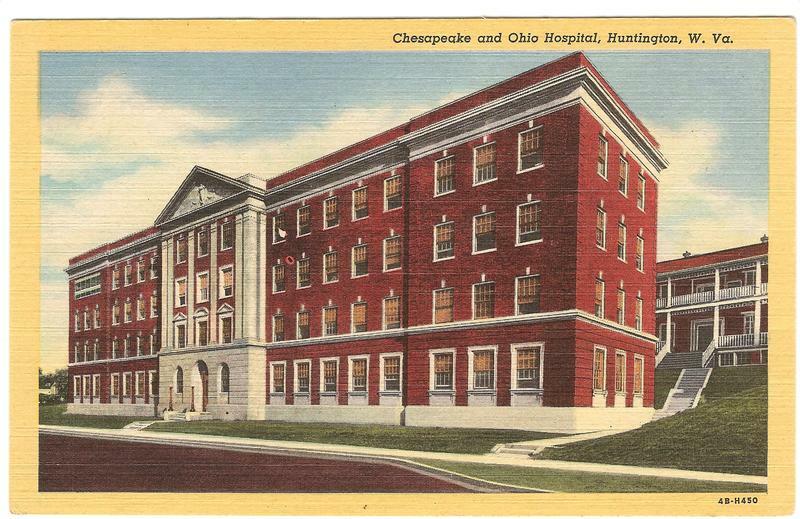 What many persons in the vicinity of the Chesapeake & Ohio hospital on upper Sixth avenue declared to have been a celestial portent of grave mien, but which others say was nothing more nor less than a huge brilliant meteor that swept the heavens shortly after dusk last night, was seen by several small boys while skating on a pond near the hospital who afterwards told a tale which is as wonderful and wierd as any of the dark mystery stories painted in classical literature. The shadows had become long and disappeared in the gathering gloom as the youngsters played about an old field close to the hospital where there is a small sheet of ice. About as they were ready to start home one suddenly cried out to the others to behold a great falling star which was zizzagging its way down the heavens. One of them, according to his mother, Mrs. J.W. Terry of Nineteenth street and Buffington avenue, who afterwards related the story to a reporter, ran terrified to his home while the others waited in breathless fear to see what would happen. The star became brighter and brighter, leaving in its path a tail of fire. Suddenly pausing over a lonely cottage in the vicinity, it spread into a great light. As it hung like a fiery apparition over the home it silently burst into a flame of illumination. As they watched the letters faded and in their stead was the face of a woman, beautiful and pale. The blazing eyes of fire seemed turned upon them, they told their parents, as slowly the spirit-like form that had come down from the stars rose over the house and finally disappeared in the eastern heavens. The youngsters, who sought out separately by persons in the neighborhood of the hospital told exactly the same story, are Charles and James Nash, the children of Mr. and Mrs. John Nash of Sixth avenue; Orben Davis, the son of Mrs. N.A. Davis, a nurse, of Sixth avenue, and Llewellyn Terry, the son of the Rev. and Mrs. J.W. Terry. The Rev. Mr. Terry is a traveling evangelist, now in the south. Orville Perry, a small colored boy, also saw the vision, according to his story. The neighborhood on upper Sixth avenue was greatly excited last night by the story of the boys and credence was given to it by many. The boys were closely questioned by many persons, who expressed fear that the mysterious thing that blazed in the heavens was an omen of ill tidings, that death or deep suffering was to follow to someone. They said that it could not have been sent for nothing. Strange tales were told there last night of a murder committed near where the wonderful sight was seen, in days long ago when the city was still young, and of a treasure buried by the murderer. Hinging onto the story it was related that on Twentieth street, some distance away is a haunted house. Several persons have moved into the place and afterwards left because of wierd sounds that startle them from their sleep in the early hours of the morning. These sounds, the tale goes, take the form of soft footsteps on the stairway and creakings of doors that never moved. None has explained these nocturnal disturbances nor why the sights that would make one's blood run cold have been there, said one woman last night, to whom the ghostly heavenly visitor that frightened the small boys brought to mind the haunted house. It is the common talk in the vicinity that there is a treasure buried somewhere near this house and that back of this hord lies deep plot of intrigue as dark as any of the narrative of the operations of Kidd, the pirate, in the early days. Writers of old times in their eastern mystery stories of strange happenings on wide deserts told of beings descended from the skies, of devils and genii risen from the depths of the region of fire, yet none dared conceive a more puzzling "yarn" than that told by the youngsters of what they thought they saw! All insisted that they were telling the truth and were apparently much frightened by what they could not understand. Many persons in the city saw a flaming meteor just after dark last night. It was described as one of the most brilliant that has ever been witnessed in this part of the Ohio valley, forming a complete arc over the heavens before it finally disappeared in the western horizon. Meteors, considered by the ancients as forerunners of disaster, famine or war, and almost as greatly feared as were comets, ever have had a romantic supernatural air about them, that leads to many a delightful tale. However, at this season meteors are not unusual, astronomy tells us. This heavenly body is nothing more than a large shooting star which has become diverted from its course in the space beyond our atmosphere and is hurled through the air. The contact of the body with the air, because of its terrific speed causes the meteor to catch fire, therefore being visible to the eye. Most meteors and shooting stars burn themselves out before striking the earth, but occasionally one reads of one of these bodies reaching the ground with such force as to bury itself in the soil or even to damage property, in case of striking a building. Examination of such fallen stars by scientists have shown them composed of earth and various metals. There are certain times of the year when falling stars are quite frequent, one of these periods being during the last of this month. At these times one may notice a large number of shooting stars if the nights are clear.